"WR6_gUnUj-ztiW07KQcOCnTel9A"/> Notes From Atlanta: How about the Other “Mainas” in Buhari’s Government? How about the Other “Mainas” in Buhari’s Government? President Muhammadu Buhari is infamously impervious to, and even contemptuous of, public opinion. That’s why his order to fire Abdulrasheed Maina who was surreptitiously reinstated into the civil service and promoted to the next level in spite of weighty allegations of corruption against him was both refreshing and pleasantly surprising. Of course, the real, far-reaching surprise would be if the president is able to summon the testicular fortitude to fire the people who conspired to pull off this audacious perversion of justice and civil service protocols. While it’s gratifying that the president has asked that the issue be thoroughly investigated, the fate of previous investigations of corruption involving people close to the president (such as Babachir David Lawal) doesn’t inspire confidence that anything earthshaking will come out of this. But maybe—just maybe—the president has now had enough and is determined to salvage what remains of his severely diminished reputation through a full-throated attack on the corruption of not just his political opponents but also of his close associates, which is frankly the sincerest test of his will to fight corruption. The Head of Service of the Federation, the Minister of Interior, the Attorney-General and Minister of Justice, and other co-conspirators may yet get the boot. Should that happen, I’d be one of the people whose confidence in the president would be restored. But don't hold your breath. What’s most significant, though, is the fact that Abdulrasheed Maina is not an aberration in this administration. He is merely an addition to a list that is already distressingly long. Let me recapitulate a few names that are going the rounds in Nigerian social media circles. A certain Louis Edozien who was fired in 2014 as Executive Director at the Niger Delta Power Holding Company (NDPHC) for failure to produce authentic credentials during an audit was reinstated and promoted to the position of Permanent Secretary in the Ministry of Works, Power and Housing in November 2016. NDPHC’s General Manager in charge of audit and compliance by the name of Mrs. Maryam Mohammed who audited Edozien’s credentials and recommended his firing was unjustly fired last year in apparent retaliatory vendetta. Interestingly, although the president reversed the dismissal of Mrs. Mohammed after she wrote to him directly, Abba Kyari allegedly overruled the president and, the woman, who is the mother of orphans, is still unemployed. In many respects, this eclipses the impunity and scandalousness of Maina’s reinstatement and promotion. 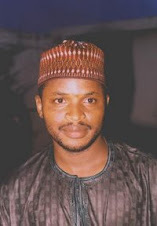 There is also the case of a Chief Registrar of the Supreme Court by the name of Ahmed Gambo Saleh who, along with two others, was charged with a N2.2 billion fraud on November 3, 2016. “The defendants are specifically accused of conspiracy, criminal breach of trust and taking gratification by Public officers contrary to Section 10 (a) (i) of the Independent Corrupt Practices and other related Offences Act 2000 and punishable under the same section of the Act,” according to the Sun of November 4, 2016. The same Saleh who hasn’t (yet) been absolved from the charges against him was appointed Executive Secretary of the National Judicial Council (NJC) on July 1, 2017. I know it’s technically outside the powers of the president to intervene in issues involving another branch of government, but we all know that the nocturnal bust of the homes of judges, including Supreme Court justices, by Nigeria’s secret police in October 2016 had a stark, unmistakable presidential imprimatur emblazoned all over it. There is another “Maina” serving as a minister in Buhari’s cabinet. According to the Premium Times of October 26, 2016, Buhari’s Minister of Niger Delta Affairs, Usani Usani, “was charged with fraud 15 years ago, after he was indicted in 2000 by the government of Cross River State where he served as a commissioner.” His indictment, the paper added, “is documented in a state government White Paper.” It can’t get any more empirically verifiable than that. Yet the man still serves as a minister in a government that bills itself as an “anti-corruption” government. The list goes on, but I’ll stop here because of the constraints of space and time. It is ironic that a government with this depth and breadth of love affair with corrupt people has the chutzpah to talk about “fighting corruption.” But the clearest sign that this government is a joke and that it’s “anti-corruption” fight is an even bigger joke came on October 25 when a presidential news release blamed “invisible hands” from the Goodluck Jonathan administration for the Maina embarrassment. 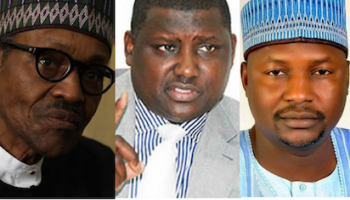 “[S]ome influential officials loyal to the previous government may have been the invisible hand in the latest scandal that saw the return of Maina to the public service, despite being on the EFCC’s wanted list,” the statement said. When I first read it on a listserv on Wednesday, I thought it was a spoof and let out a burst of deep, loud, hearty laughter. I said it was impossible for this to be true until I read it in respected traditional news outlets. I give up. The battle has been lost irretrievably. News that Buhari has approved the payment of pension to ex-Biafran police officers who served on the rebel side during Nigeria’s 30-month Civil War from 1967 to 1970 is heartening. It is little symbolic gestures like this that nurture national cohesion. National cohesion won’t magically emerge out of thin air because some leader proclaimed that Nigeria’s unity is “settled” and “non-negotiable”—or that the question of Nigeria’s unity had been settled with some rebel leader at a private meeting. Nation-building is never “settled” and is always in a state of negotiation and renegotiation. Unity is consciously sowed, watered, and nourished by acts of kindness to the disadvantaged, by equity and justice to all, by consensus-building, by deliberate healing of the existential wounds that naturally emerge in our interactions are constituents of a common national space, and by acknowledging and working to cover our ethnic, religious, regional, and cultural fissures. If Buhari, from the incipience of his presidency, had offered this sort of olive branch to parts of Nigeria that didn’t vote for him, we won’t have the current immobilizing fissiparity that is threatening to tear down the very foundation of the country. But it’s never too late to do the right thing.